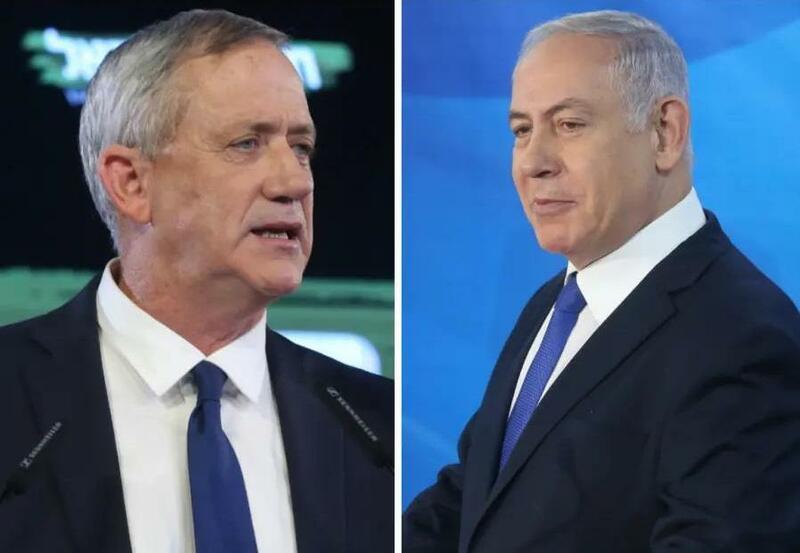 JERUSALEM, April 9 (Xinhua) -- Israeli Prime Minister Benjamin Netanyahu and Benny Gantz, an ex-general and leader of a centrist party, both claimed victory on Tuesday night in the closely-fought election race. At 10 p.m. (1900 GMT) after ballots were closed, the country's three main TV stations released exit polls but showed contradicting results. Gantz, Israel's former chief of forces and the leader of the Blue and White party, claimed victory over the country's long-serving incumbent prime minister. Gantz's statement followed an exit poll on Channel 12 TV news, Israel's highest-rating TV station, which showed he has won 37 seats while Netanyahu lags behind with 33 seats. "The Israeli people have spoken in this election there are clear winners and losers... Bibi (Netanyahu) lost big time," Gantz said. He based his statement on results of two other major TV stations' exit polls, showing Netanyahu and Gantz's parties were tied and right-wing bloc won 8-12 seats more than the left-centrist bloc. "The right-wing bloc won a clear victory," Netanyahu said. He thanked his voters and said that as soon as tonight he "will begin working on forming a right-wing government with natural potential partners." In the Israeli system, a governing coalition needs at least 61 seats in the 120-seat the Knesset (parliament). No single Israeli party has ever won enough seats to form a government, and all governments have been coalitions of several parties. Netanyahu is seeking a fifth term in office. Gantz has been the toughest challenger to his consecutive ten-year-long ruling. The results of the elections will determine Netanyahu's political future, as he is facing serious corruption allegations and a possible indictment.